This study is a collaborative effort between CW3E and University of Arizona that identifies a terrain feature along the Arizona-New Mexico border just north of Mexico that is potentially important to the weather and climate of the southeast Arizona summer monsoon. The terrain feature is a “gap” that is approximately 250 km across and 1 km deep and represents the lowest terrain elevation along the 3000-km length the Continental Divide from 16-45°N. The name “Chiricahua Gap” is introduced to identify this key terrain feature, which reflects the name of a nearby mountain range in southeast Arizona and the region’s Native American history. The importance of the Chiricahua Gap is that it represents the primary pathway in which low altitude atmospheric water vapor is transported across the Continental Divide. Motivated by identification of the Chiricahua Gap, upper-air observations from a wind profiling radar in Tucson, model reanalyses (Climate Forecast System Reanalysis), and gridded daily precipitation data (NCEP Stage-IV) are used to construct a case study and 15-year climatology to link summer monsoon rainfall events in southeast Arizona to low-altitude water vapor transport within the Chiricahua Gap. The results show that 76% of the wettest summer monsoon days in southeast Arizona during 2002-2016 occurred in conditions of low-altitude easterly water vapor transport in the Chiricahua Gap on the previous day. This result highlights how low-altitude water vapor associated with the wettest summer monsoon days in southeast Arizona originates from the east side of the Continental Divide, which differs from previous studies published since the 1970s. Much of the recent scientific literature points to southwesterly surges of low-altitude water vapor from over the Gulf of California as the primary driver of rainfall over southern Arizona during the summer monsoon. The current study by F. M. Ralph and T. J. Galarneau shows that the source region of low-altitude water vapor in southeast Arizona during the summer monsoon is potentially more complex, and is significantly influenced by source regions east of the Divide. The paper is an example of CW3E expanding its research to examine the dynamics of the North American monsoon. Because monsoon is an important source or water for the US southwest and can cause flooding events, particularly flash floods, better understanding and improving forecasts of the North American monsoon is and important component of CW3E achieving its goal of revolutionizing the physical understanding, observations, weather predictions, of extreme events in Western North America and their impacts on floods, droughts, hydropower, ecosystems and the economy. Figure 1: Terrain height (shaded in m) over Arizona, New Mexico, western Texas, and northern Mexico. Key terrain features are labeled in black. The location of Tucson, Arizona, is labeled by the black-filled circle. 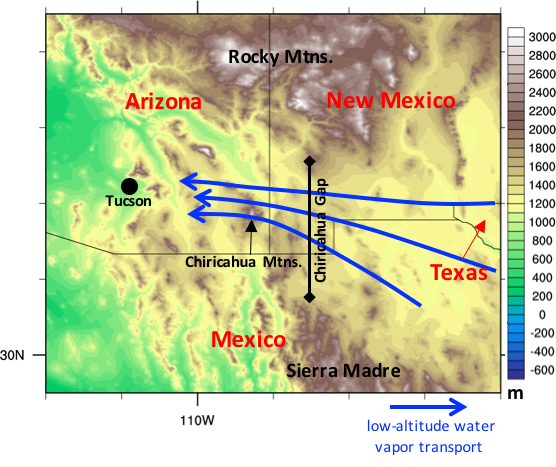 Low-altitude easterly water vapor transport through the Chiricahua Gap is shown by the blue arrows. This figure is modified from Fig. 1b in Ralph and Galarneau (2017).